The reason for the color code added is the ability for a defense to make adjustments on the field by using colors rather than using the term for the actual coverage. 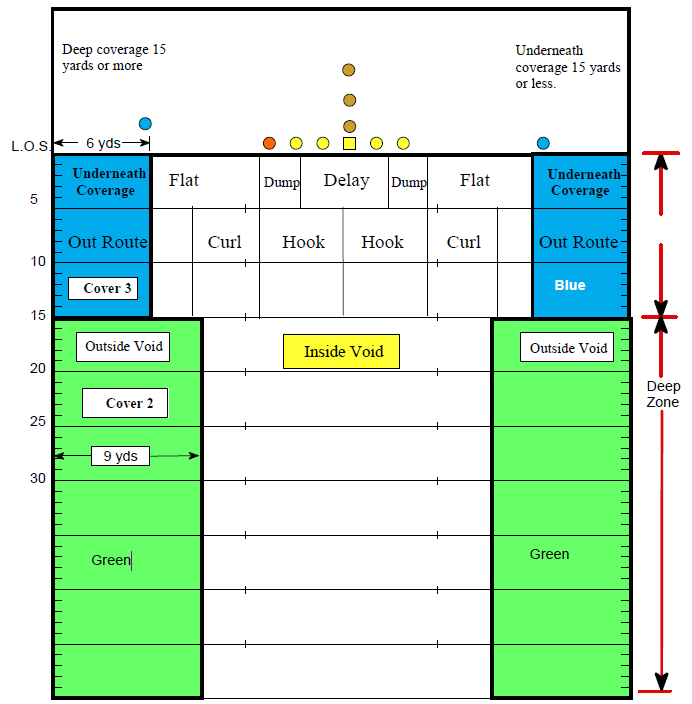 Field identification is important to understand what area of the field your receivers will be running routes through. The Blue area in this illustration shows you the side line rule for underneath coverage in Cover 3. The flat defender usually will break down when defending the flat at about 6 yards from the side line. The green area shows you how the 2 deep coverage works. A cover 2 defender usually will stay off the side line at about 9 yards. The deeper the routes the further off the sideline a defender can play because, the flight time of the ball thrown. The diagram above breaks the field down into zone areas. Each area of the field is broken down into areas of responsibility as defenders drop. 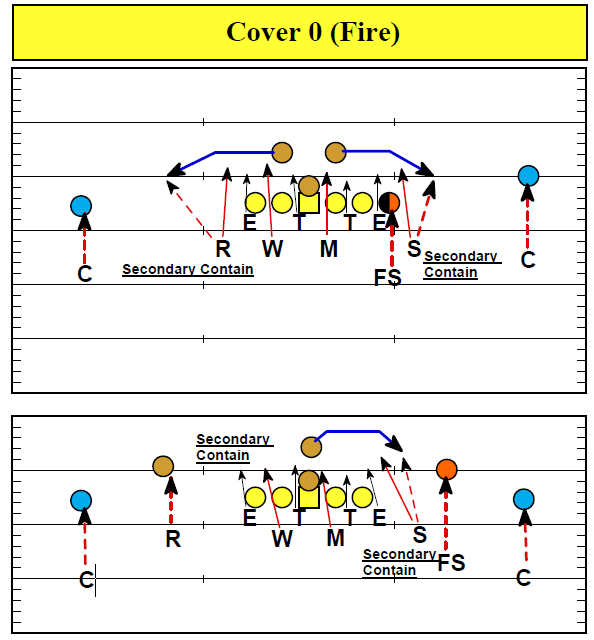 You will always have two areas of responsibilty for understanding coverages, an underneath coverage which extends fifteen yards deep from the line of scrimmage and deep coverage that takes you fifteen yards or deeper. When you talk about zone coverage and the concept of playing the receiver in your zone, you must first be aware of who can become a potential threat in your zone. 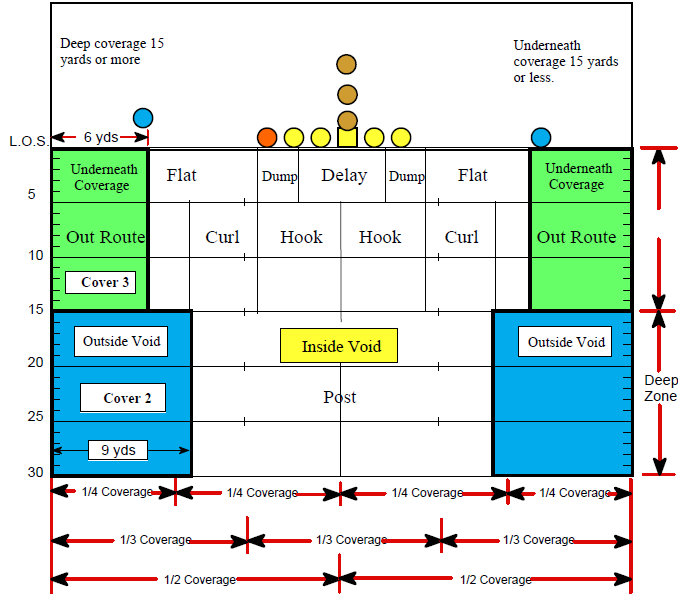 A defender must first begin by numbering their eligible receivers from the outside in, and by naming the receivers in accordance with the pass zones they can initially threaten. # 1 Receiver is considered Flat. 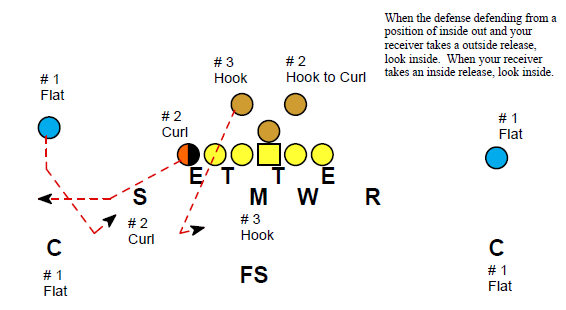 # 2 Receiver is considered Curl. # 3 receiver is considered Hook. Remember: If you have Flat then stay as wide as the widest receiver. If you have curl make the quarterback throw across your face. If you have Hook, stay inside the same as you would if you had Curl. Depending upon the offensive formation the Outside Inverts are the first to make their adjustments and come off their “Dog” to cover a receiver or running back to their side man to man. Strike and Razor have number two receiver to their side. Defensive Strength: Cover “0” is an eight man rush and is a full pressure defensive scheme. Defensive Weakness: Possible mismatch with Sam and Rover with # 2 receiver too their side. When might Parts 2 through 4 be sent for Understanding Secondary Play and Coverages, if it has not already been forwarded? I will be including those in the upcoming days emails.